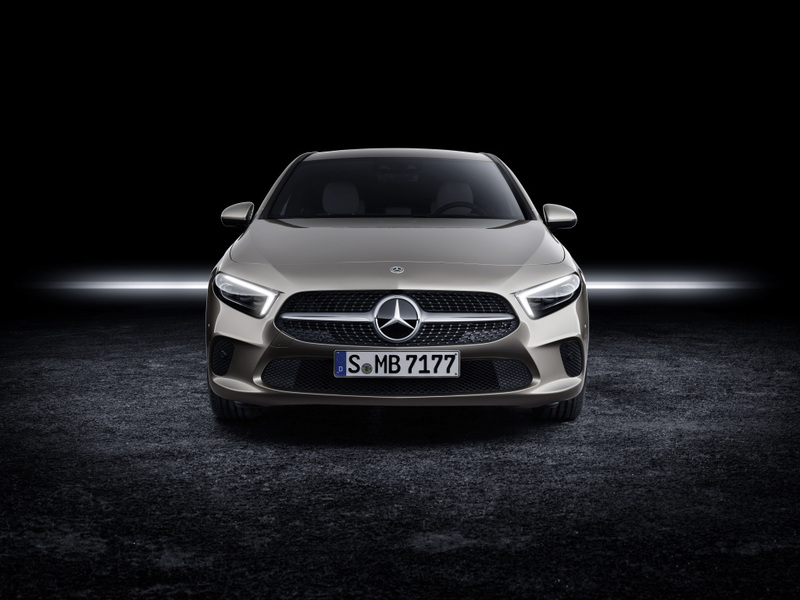 The new generation of compacts has made a key contribution to the rejuvenation and image-change of the Mercedes-Benz brand. 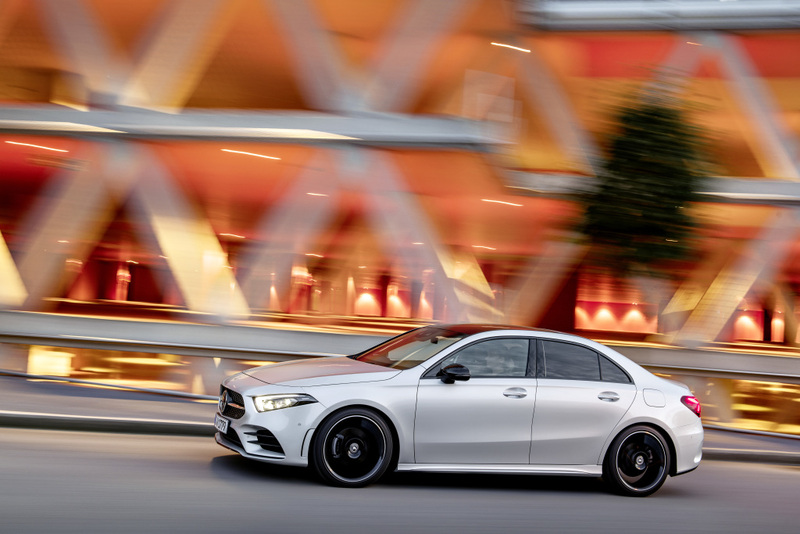 The launch of the four-door CLA Coupe in 2013 was the first time a compact car from Mercedes- Benz was sold in the U.S. market. 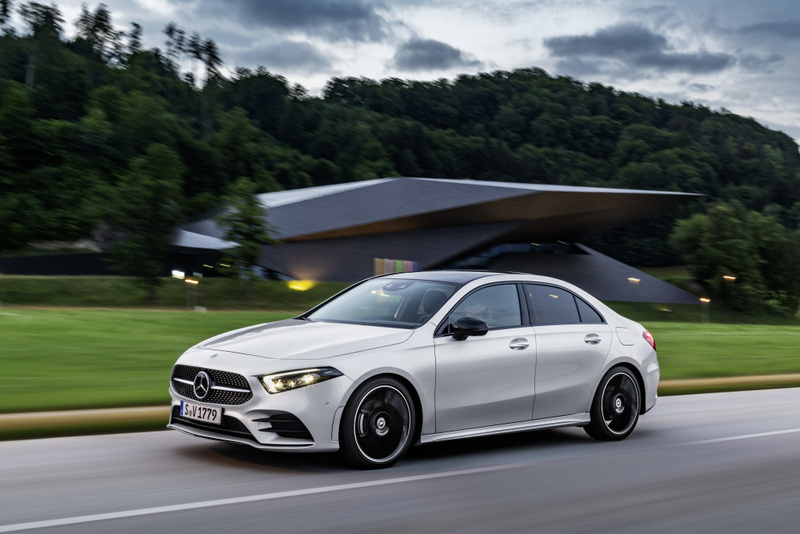 In 2017, nearly one in two buyers of a Mercedes-Benz compact car in the U.S. had previously driven a competitor vehicle, and more than 50-percent of the CLA customers were new to Mercedes-Benz (first-time buyers and conquests). 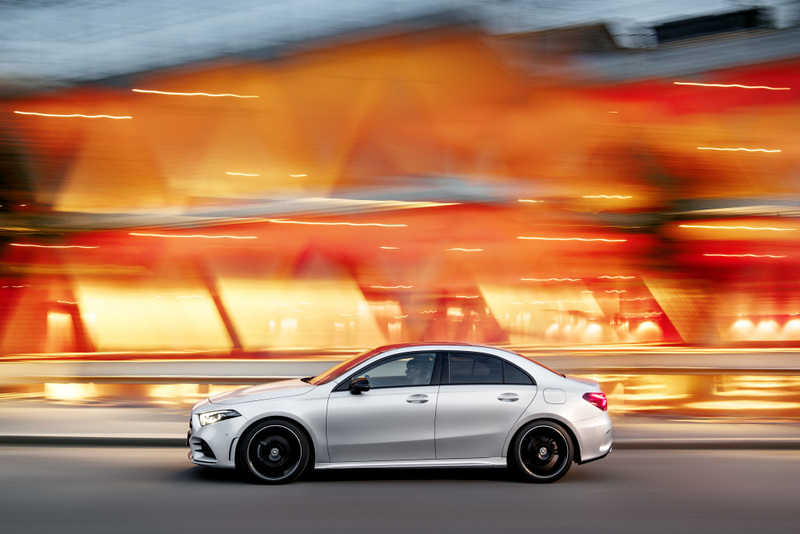 The 1997 A-Class originally established the compact car segment of Mercedes- Benz that exists today. 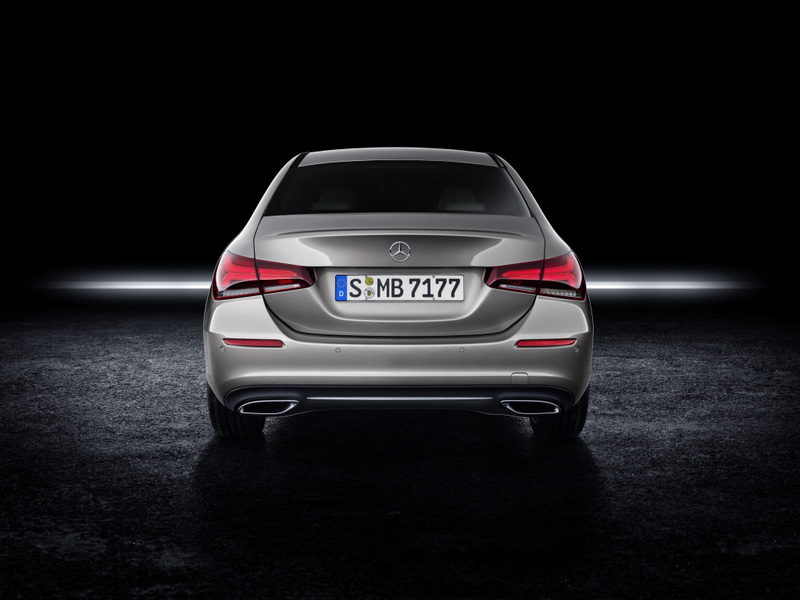 Since then, more than six million models have been delivered worldwide. 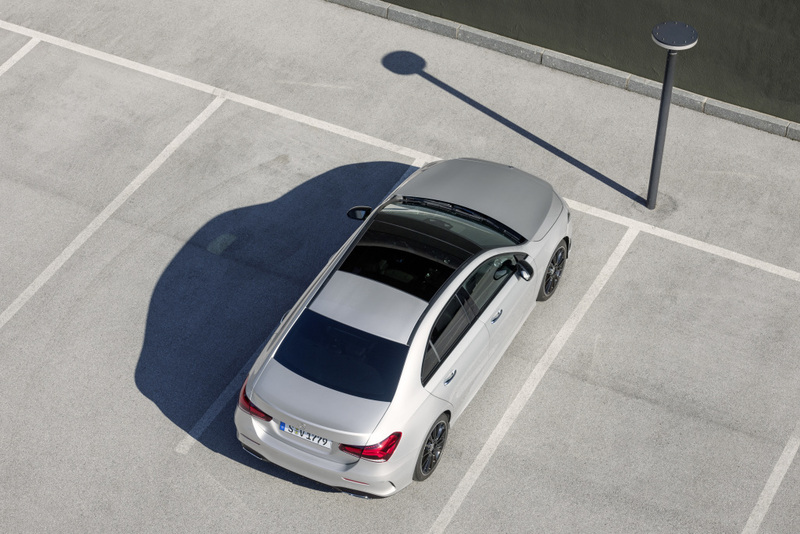 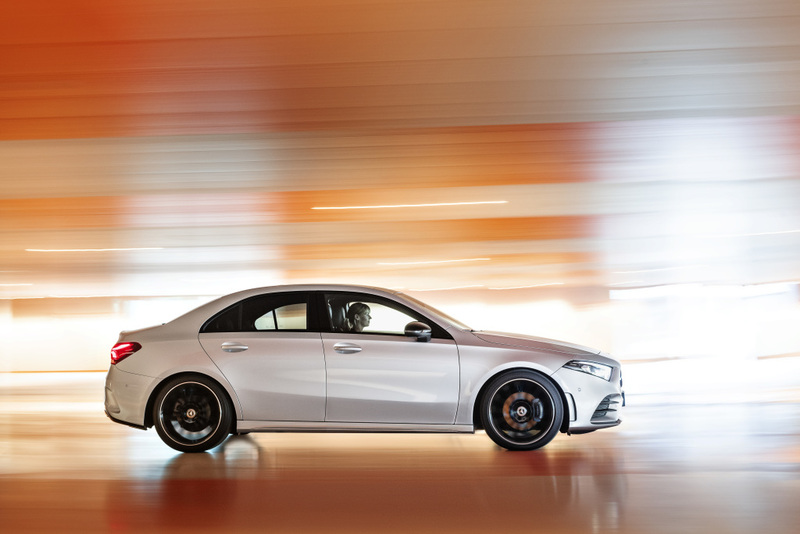 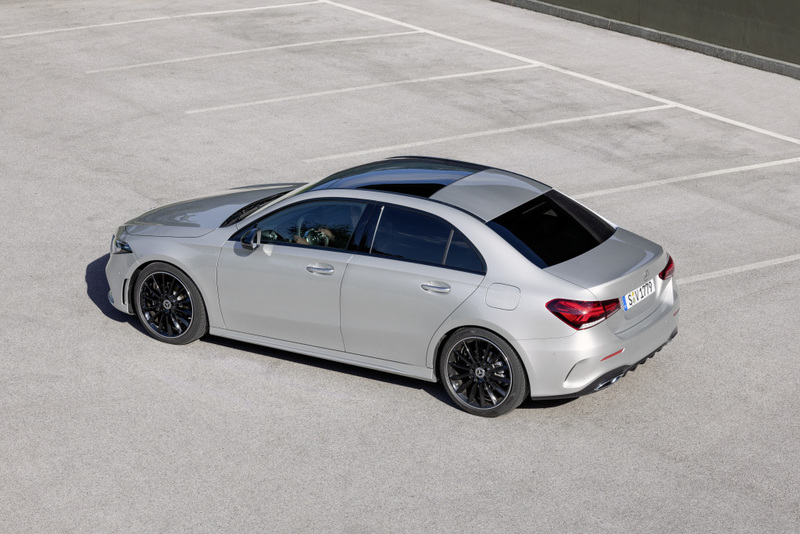 As the seventh model, the A-Class Sedan further expands the range of Mercedes-Benz compact cars. 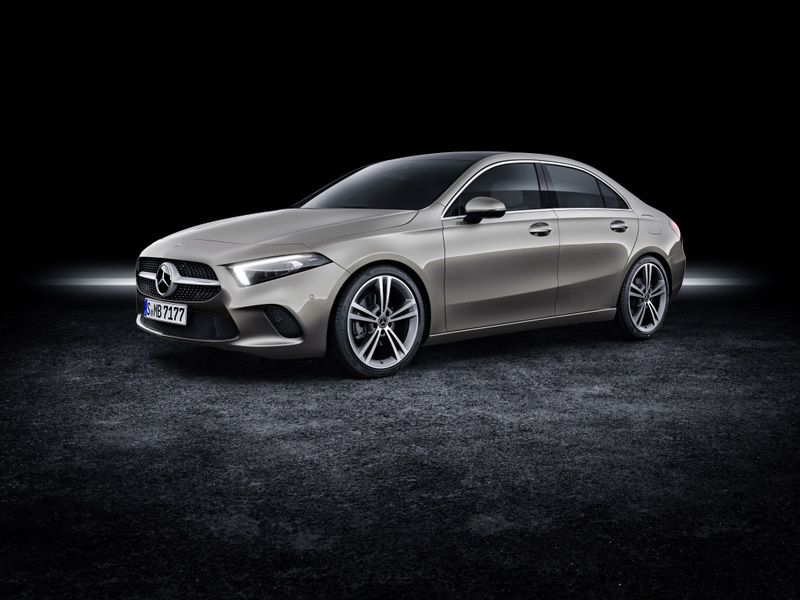 A logical addition, because with the C, E and S-Class, Mercedes-Benz continues to hold its position as a top- manufacturer of premium sedans. 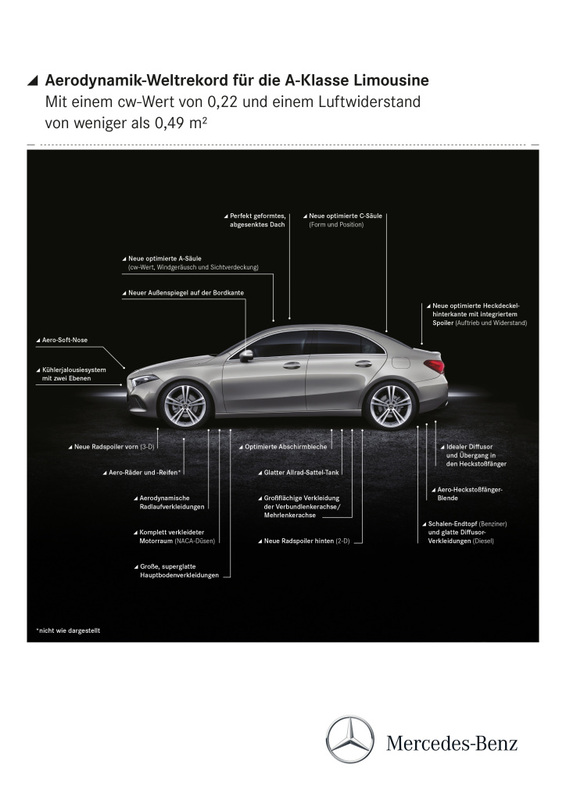 with unique design and equipment lines including Progressive (standard) and the optional AMG Line. 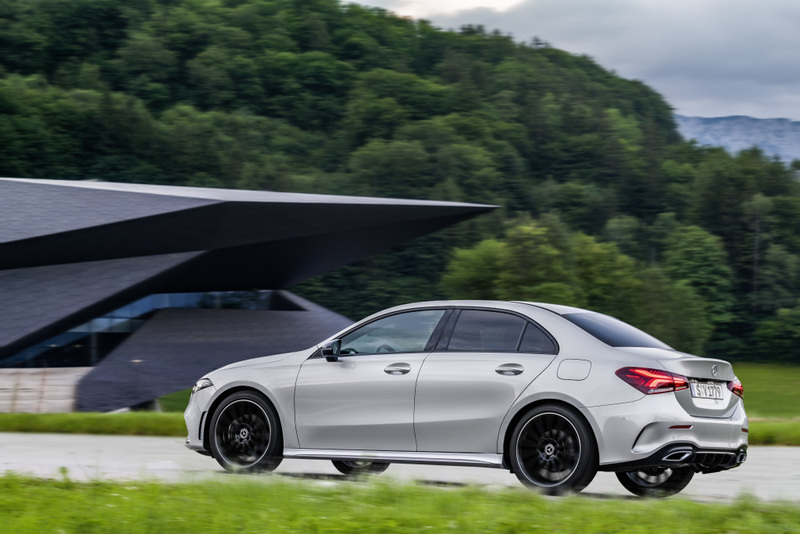 A Night Package is also available as an option. 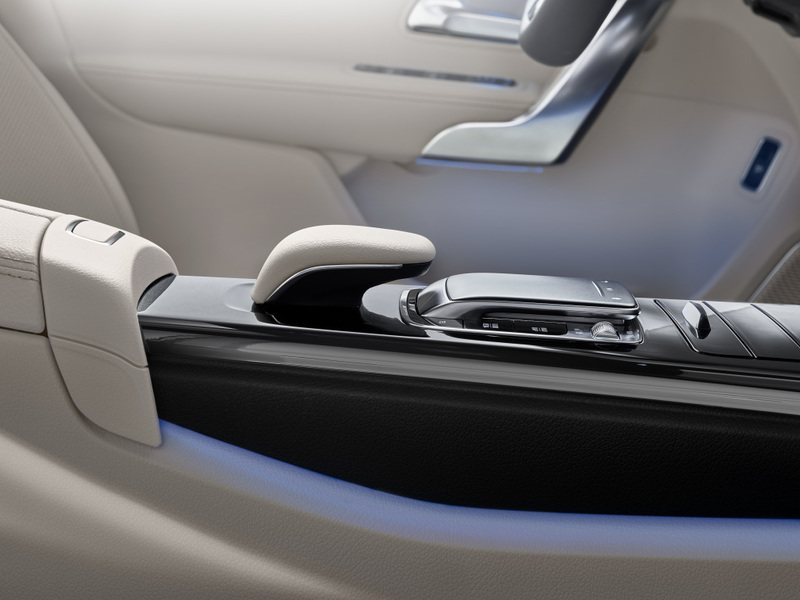 KEYLESS-GO with HANDS-FREE ACCESS will also be one of the available options. 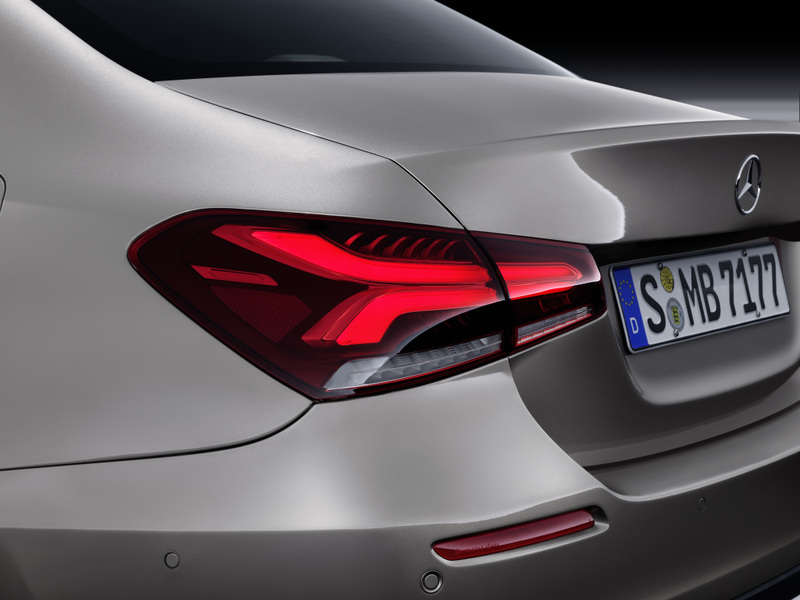 The HANDS-FREE ACCESS function conveniently enables the hands- free and fully automatic opening of the trunk lid with a kicking motion of the foot under the rear bumper. 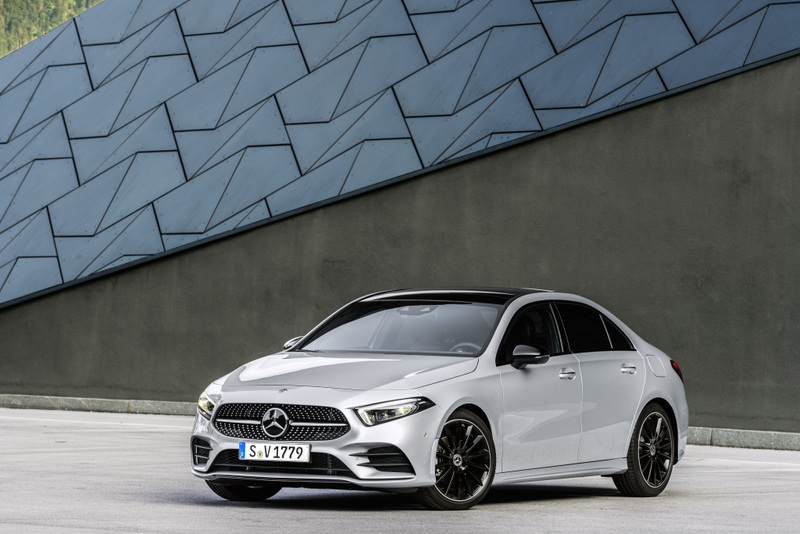 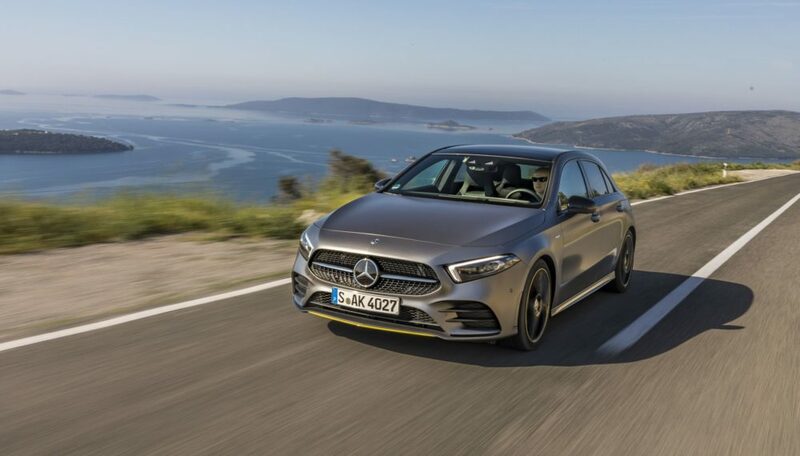 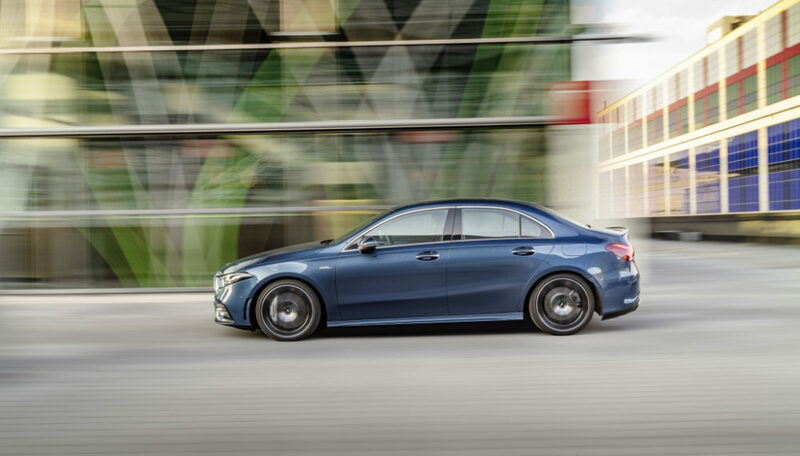 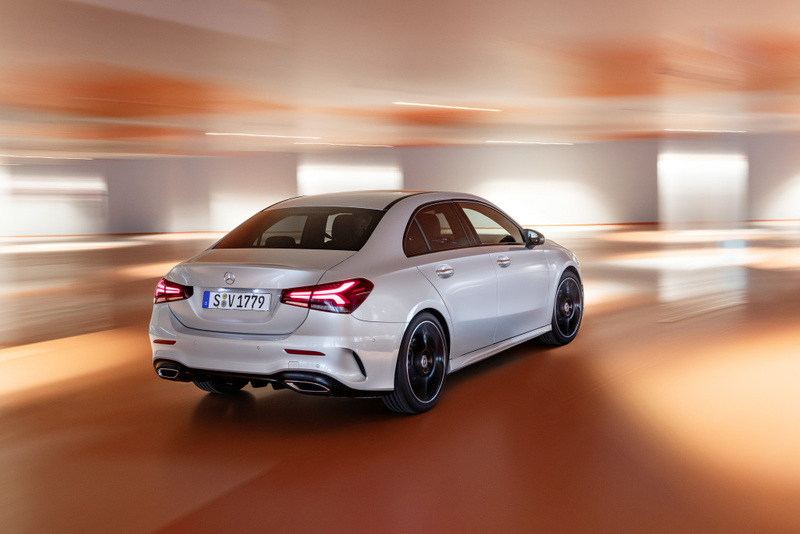 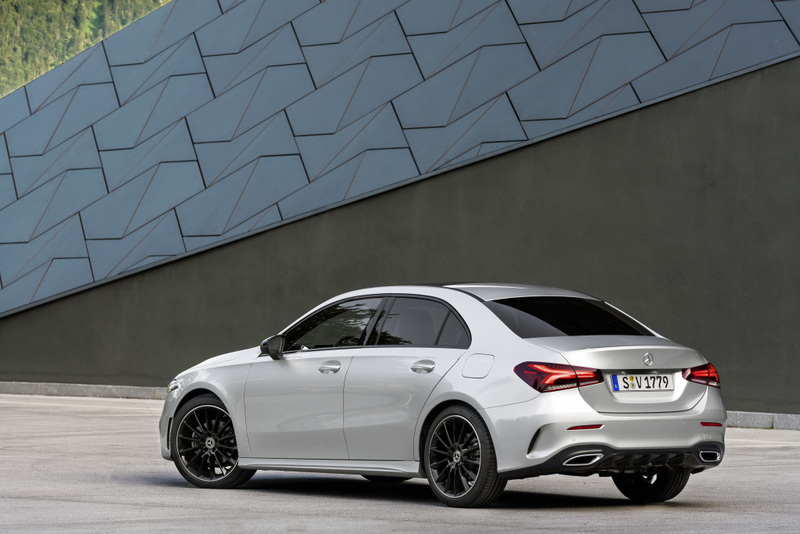 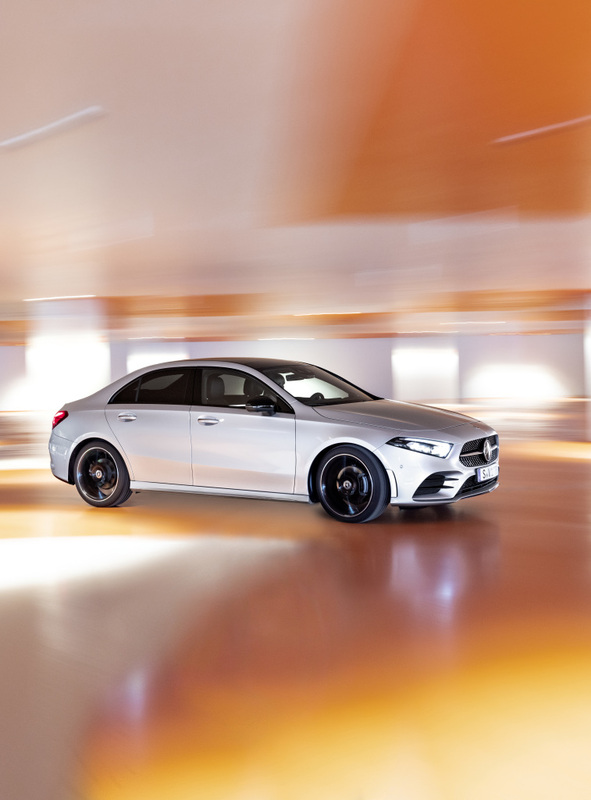 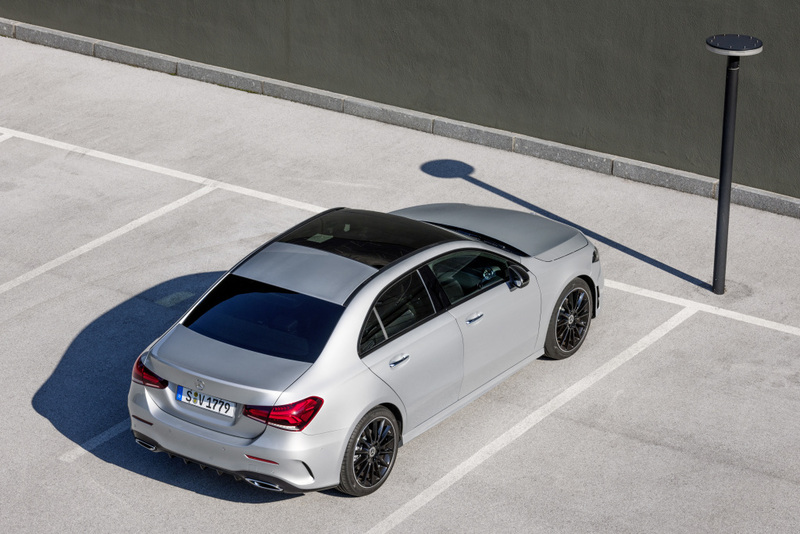 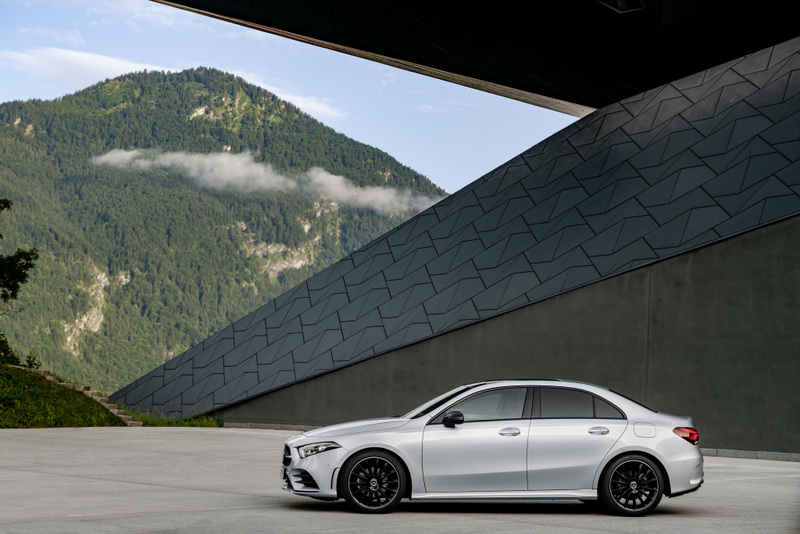 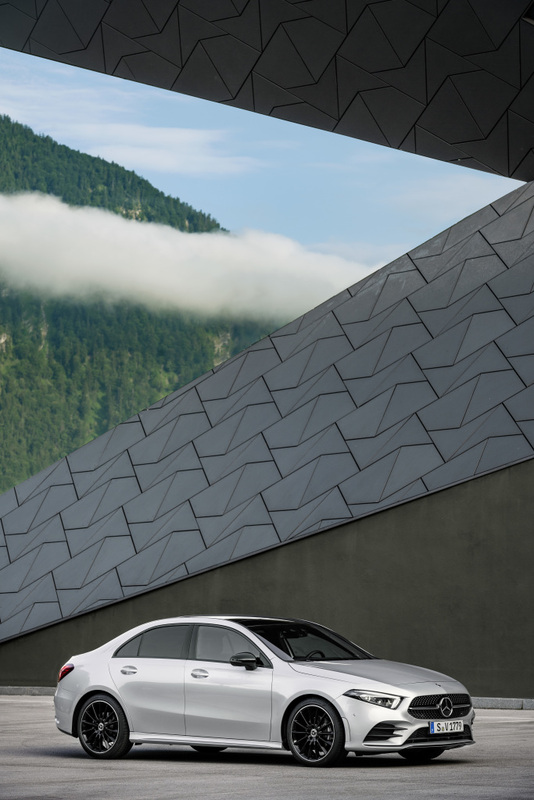 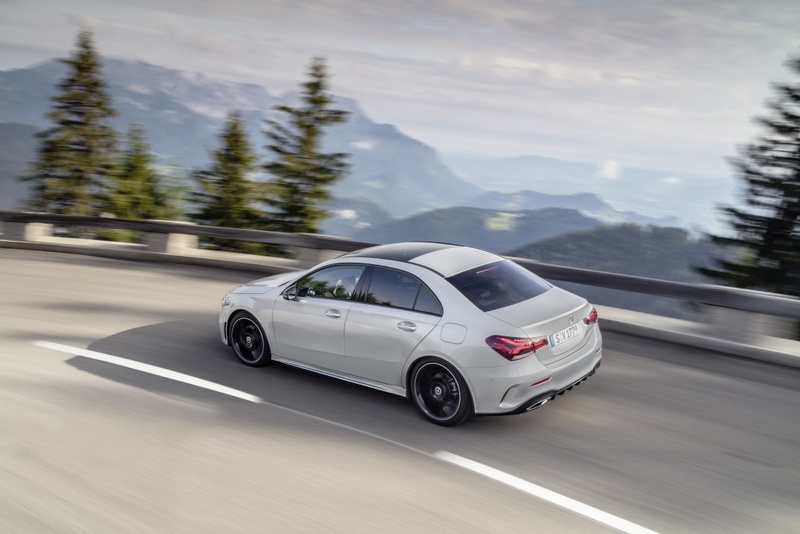 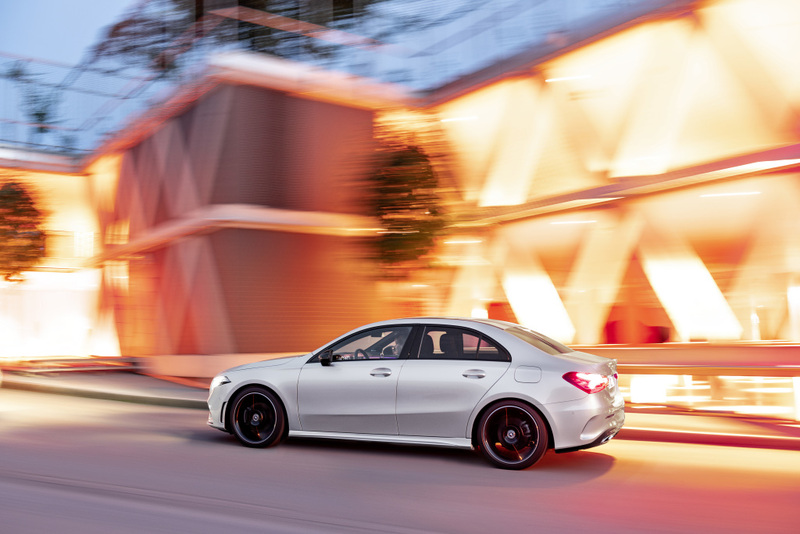 The A-Class Sedan seamlessly embodies the design idiom of Sensual Purity with its purist design that emphasizes distinct yet harmonious surfaces. 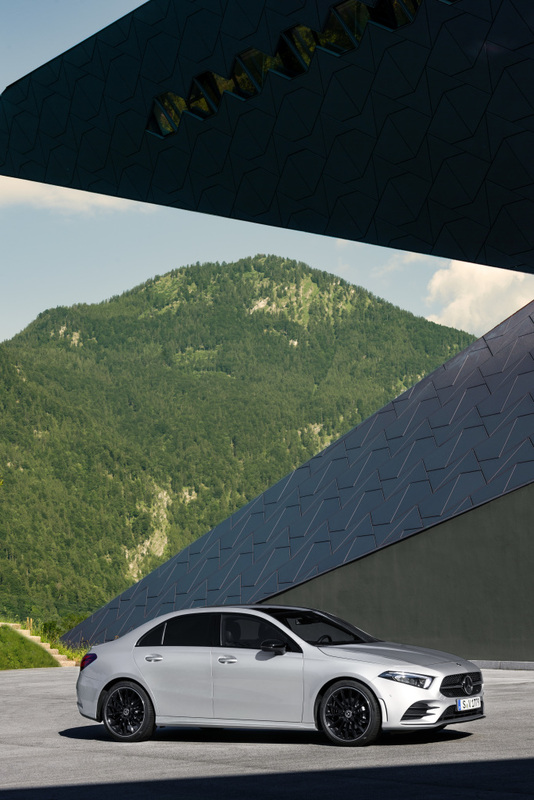 Clear, formal shapes emphasize surface areas with reduced lines and precise gaps. The new A-Class Sedan has the proportions of a dynamic and compact sedan with short front and rear overhangs. 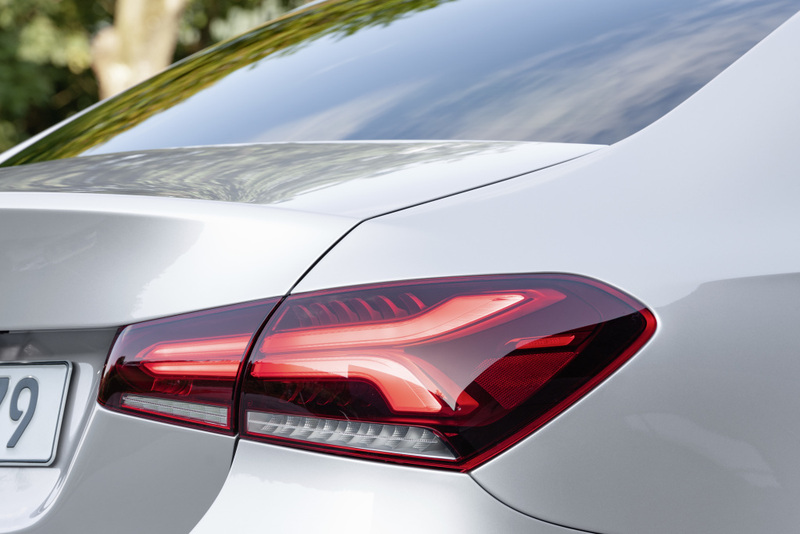 the avant-garde design of the dashboard. 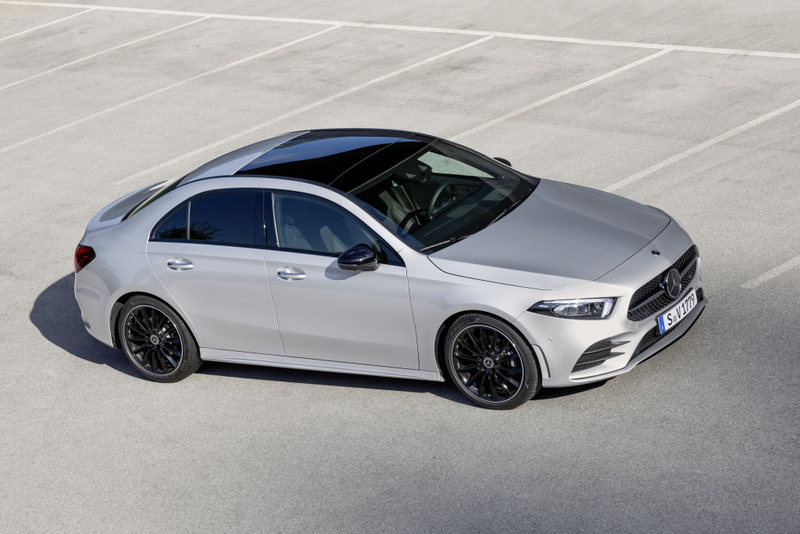 The designers completely dispensed with the cowl above the cockpit. 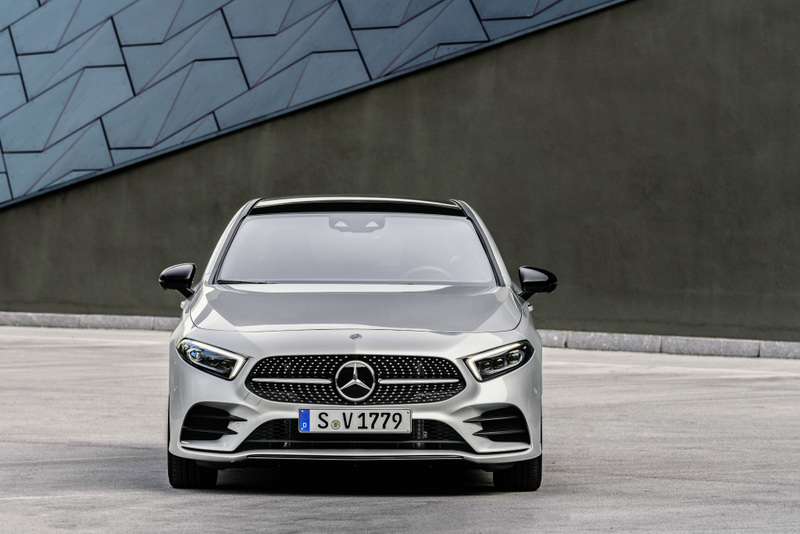 As a result, the wing-shaped main body of the dashboard extends from one front door to the other with no visual discontinuity–the widescreen display is completely free-standing. 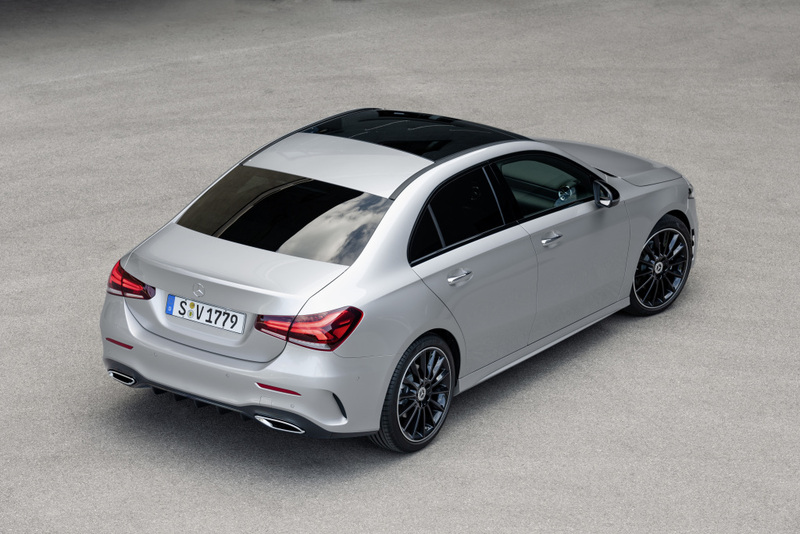 The sporty turbine look of the new air vents is another highlight. 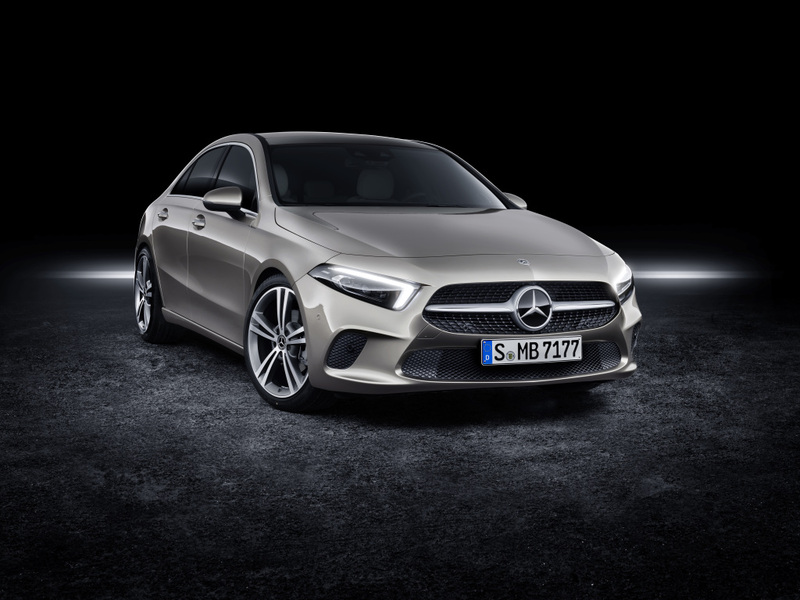 Mercedes.” The touchscreen is part of the comprehensive MBUX touch-control concept – a triad consisting of the Touchscreen, Touchpad on the center console and Touch Control Buttons on the steering wheel. 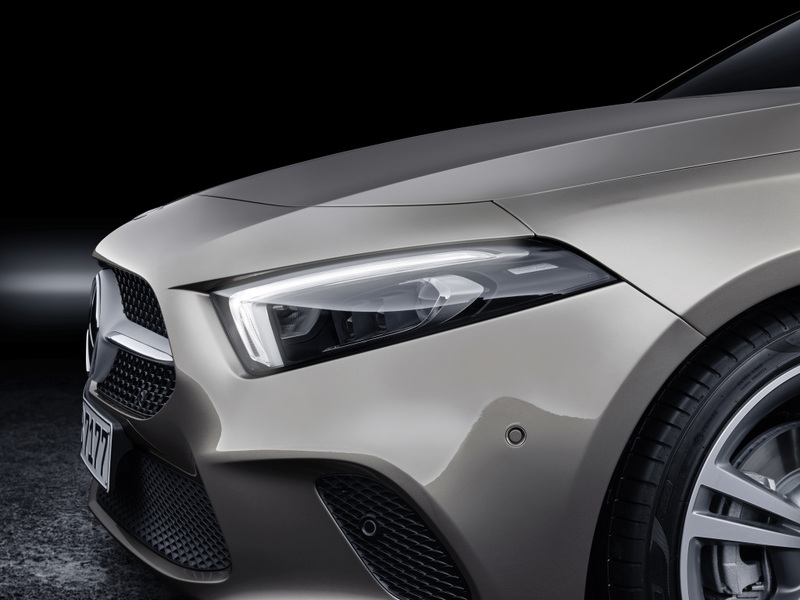 A head-up display is also optionally available. 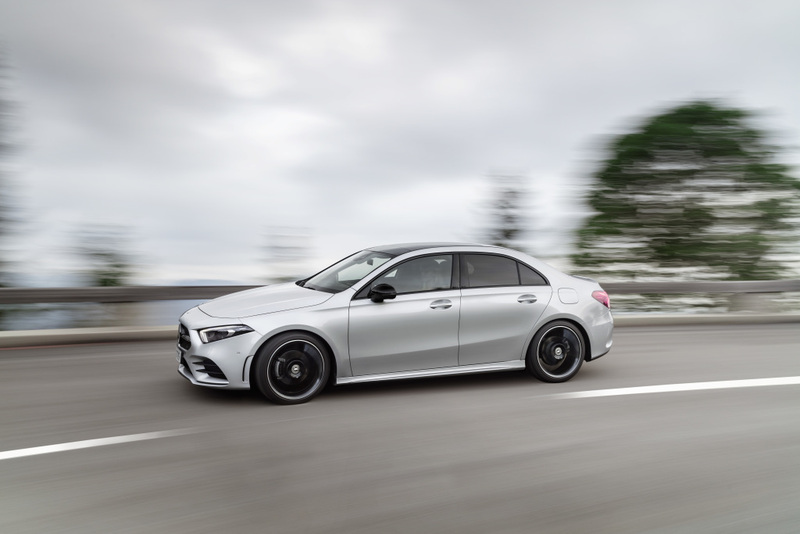 Active Brake Assist is standard for the new A-Class. 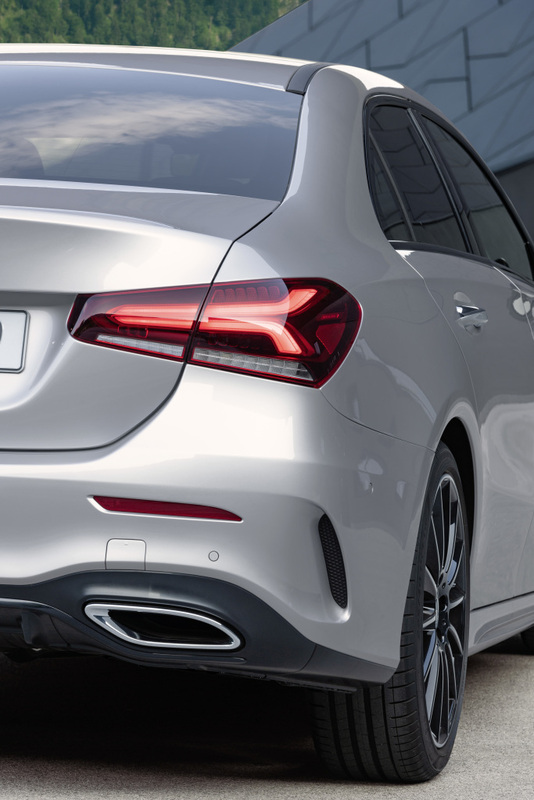 Depending on the situation, it can help to effectively mitigate or avoid the consequences of rear- end collisions with slower-moving, stopping or stationary vehicles ahead. 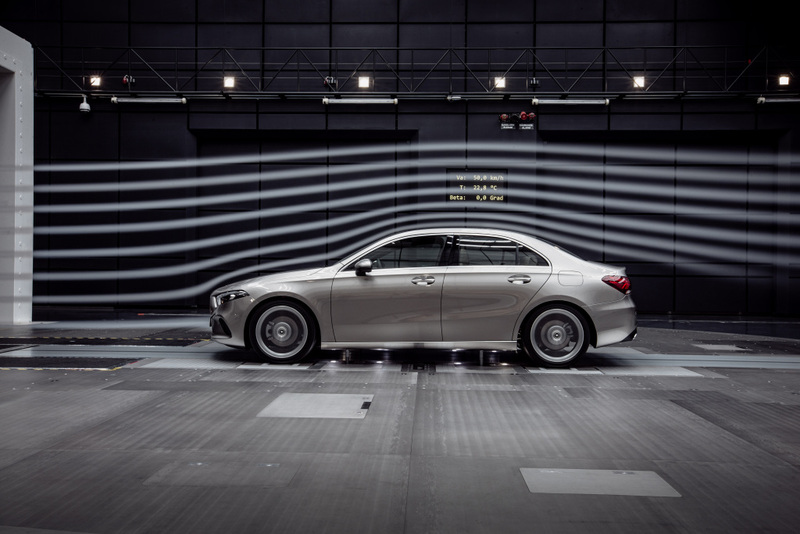 The system can even recognize crossing pedestrians and cyclists, and can intervene or support the driver in possible collision scenarios. 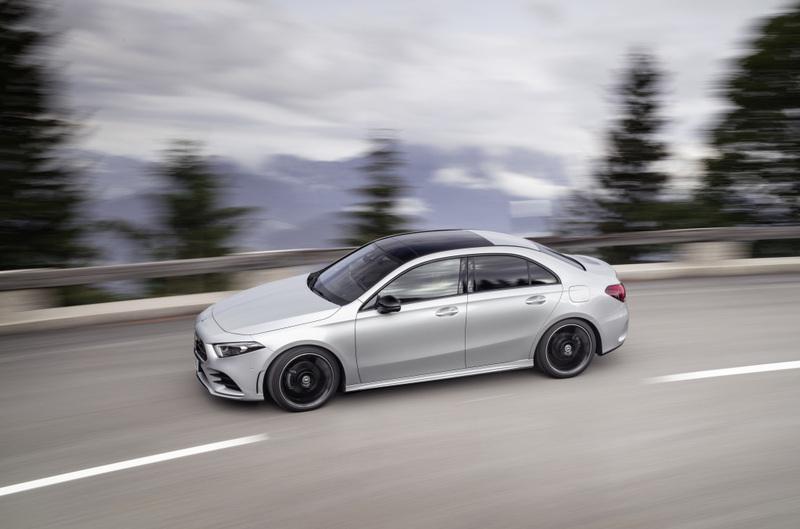 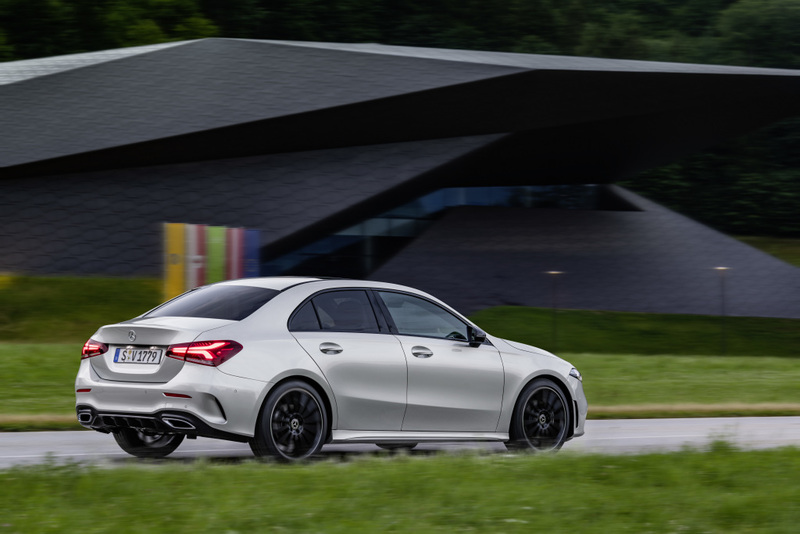 The new A-Class is also the first Mercedes-Benz model to be developed at the new Technology Centre for Vehicle Safety (TFS). 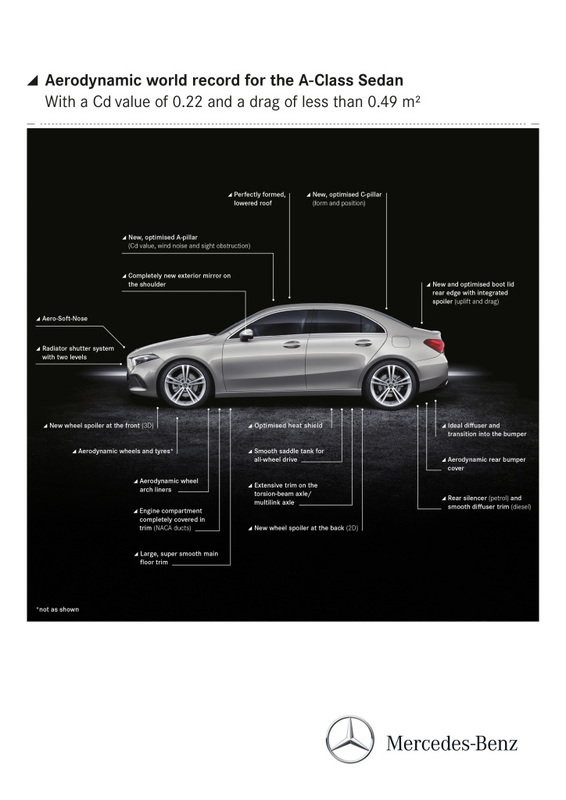 The design of the vehicle structures incorporates findings from research into real accidents. 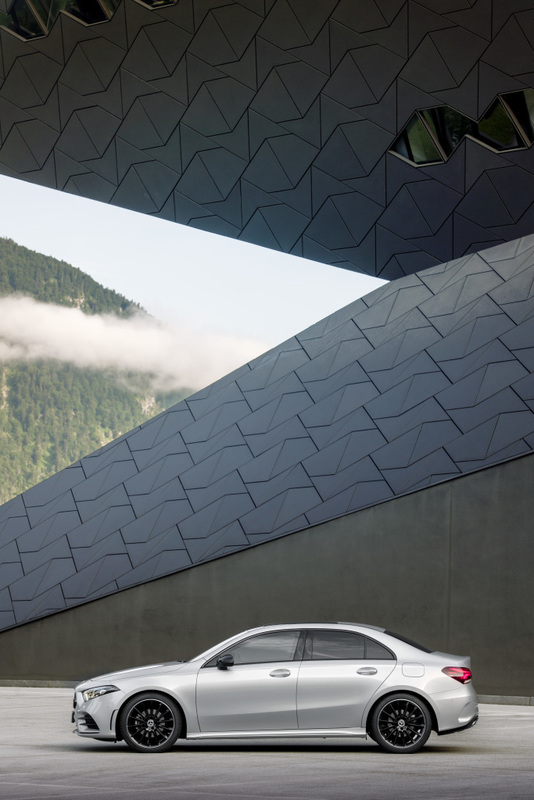 Every single body shell component was developed according to loads and stresses encountered, with respect to geometry, material thickness, joining technology and material quality (increased proportion of high-strength and ultra-high- strength sheet steel). 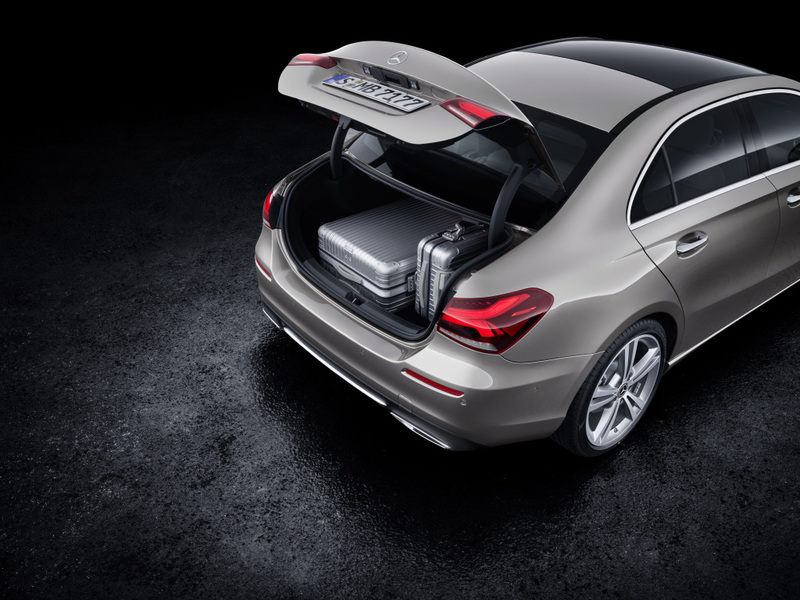 The centerpiece of the body’s safety concept is the highly rigid passenger compartment. 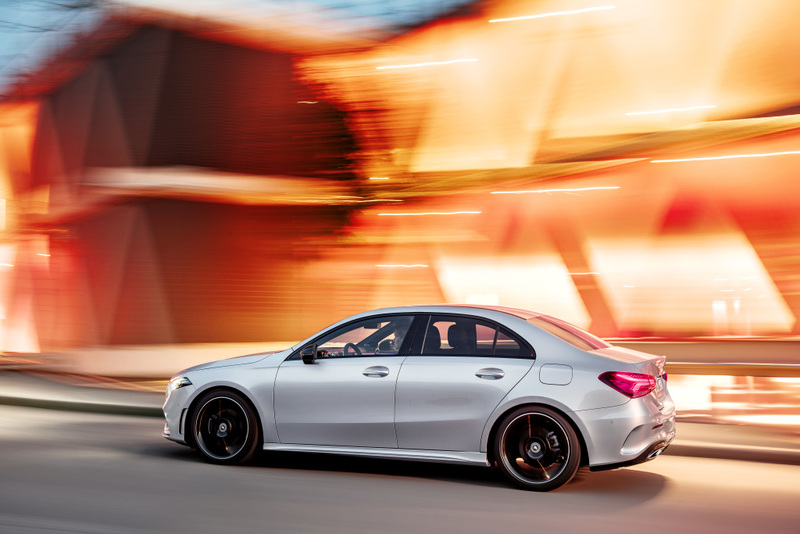 A greater use of high-strength, ultra-high-strength and press- hardened sheet steel results in an impressive rigidity when subjected to accident-induced stress – for example, in frontal, lateral or rear-end collisions and roll-overs. 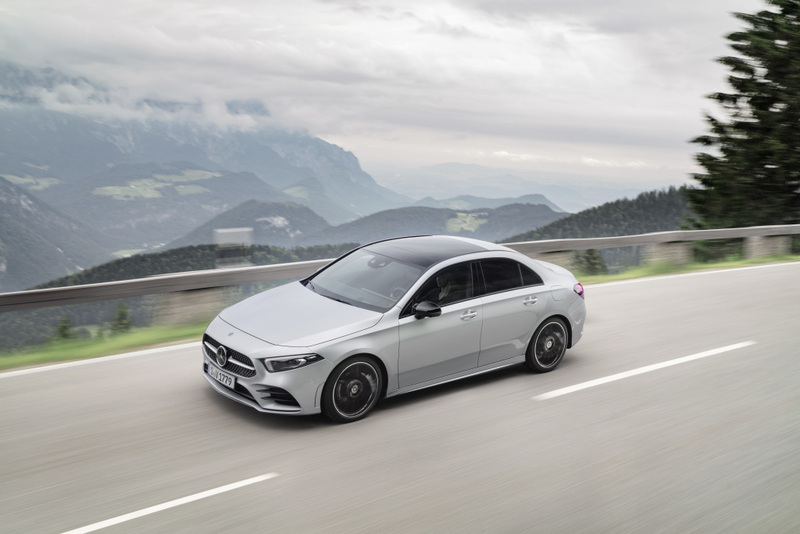 The driver and front passenger seats each have a three-point seat belt with a belt force limiter and belt tensioner. 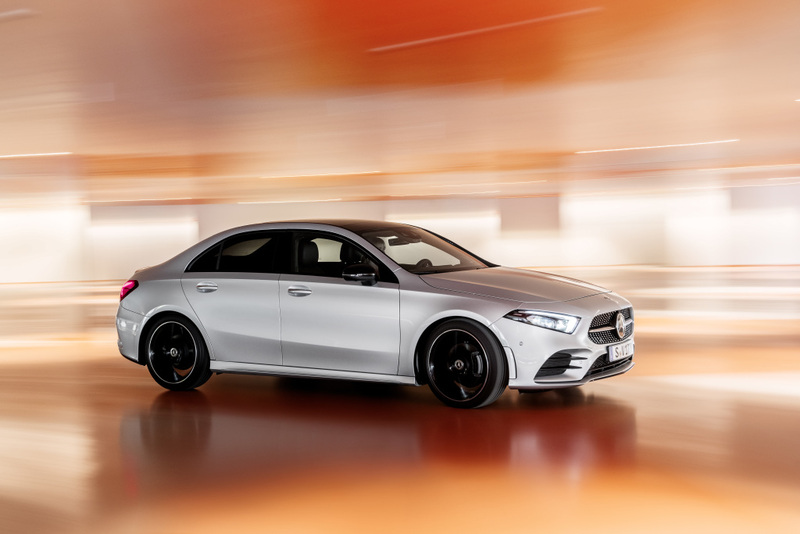 As standard, the new A-Class is equipped with driver and front passenger airbags, a driver’s knee airbag and window airbags. 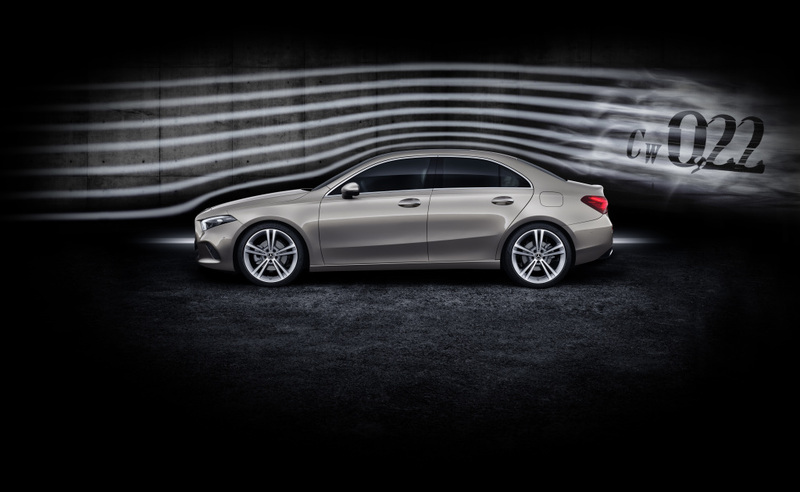 Unlike in many competing models, the window airbags cover the A- pillar for more complete passenger protection. 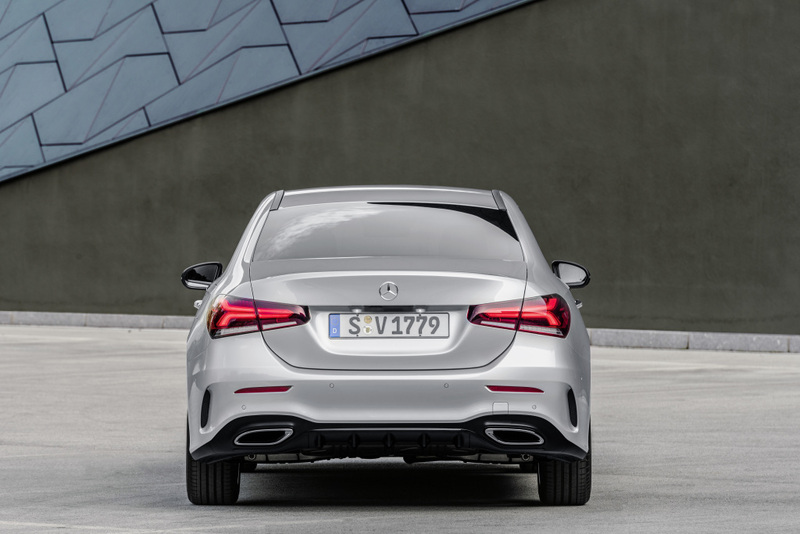 Thorax-pelvis side airbags are also standard in the front and available as an optional addition for the rear. 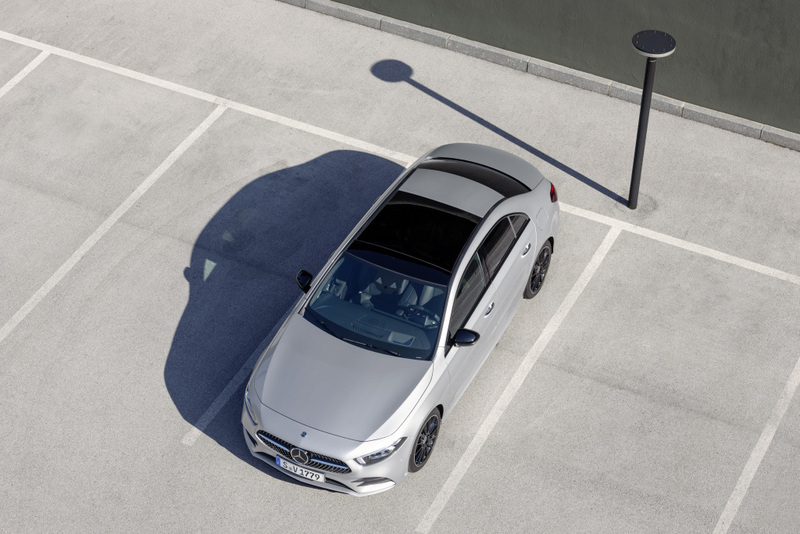 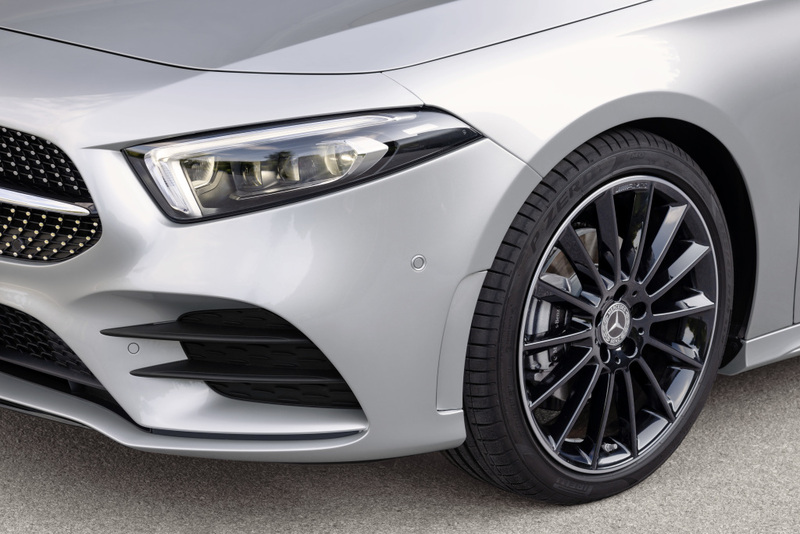 The front axle of the new A-Class features a McPherson design. 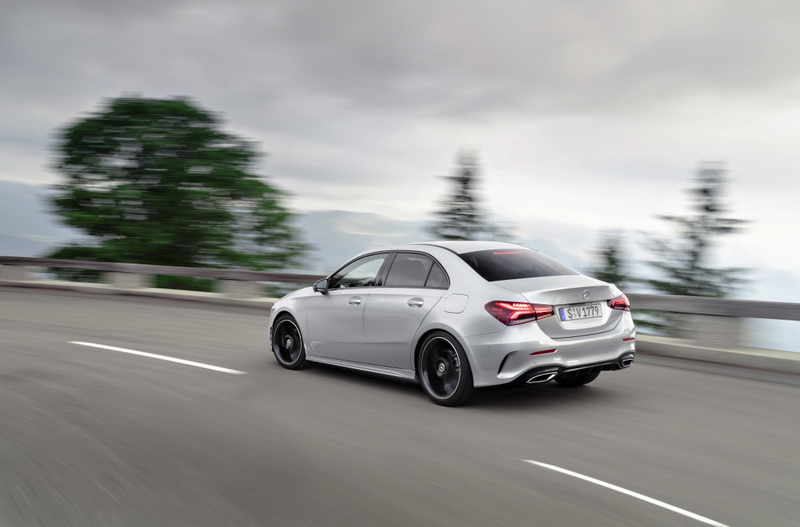 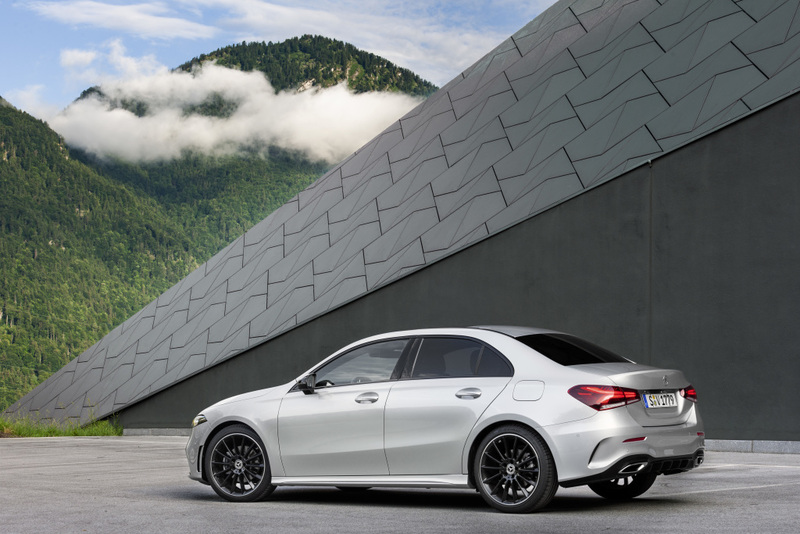 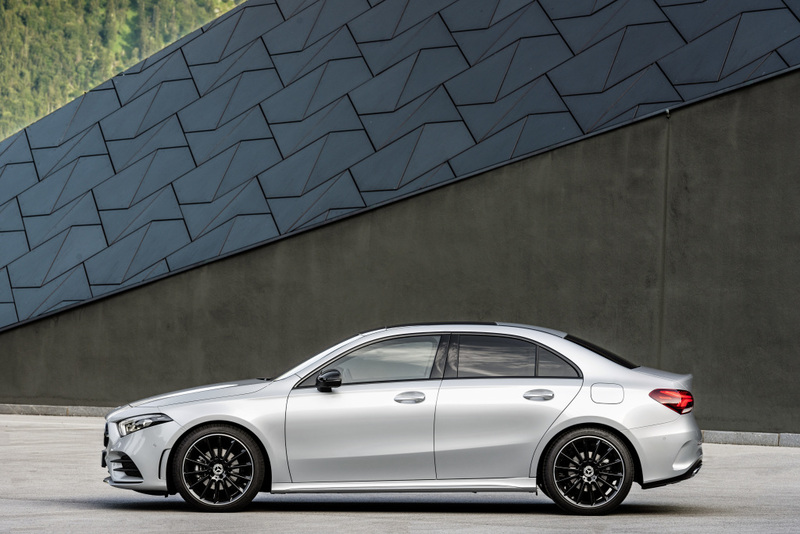 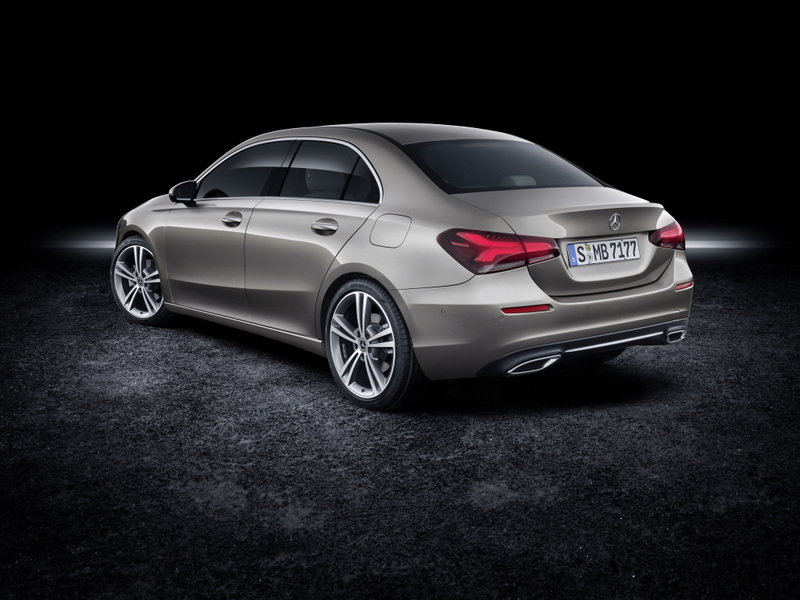 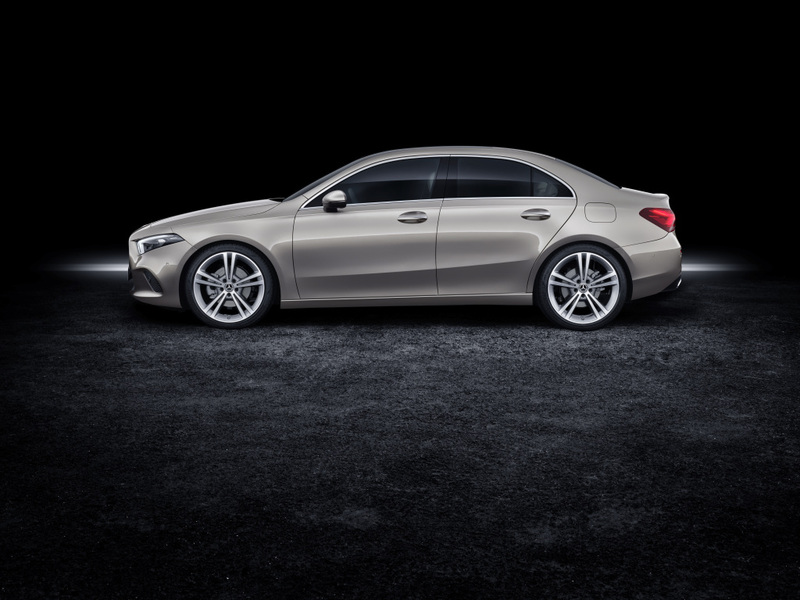 For models with 4MATIC, adaptive damping or larger wheels are fitted with a complex four- link rear axle. 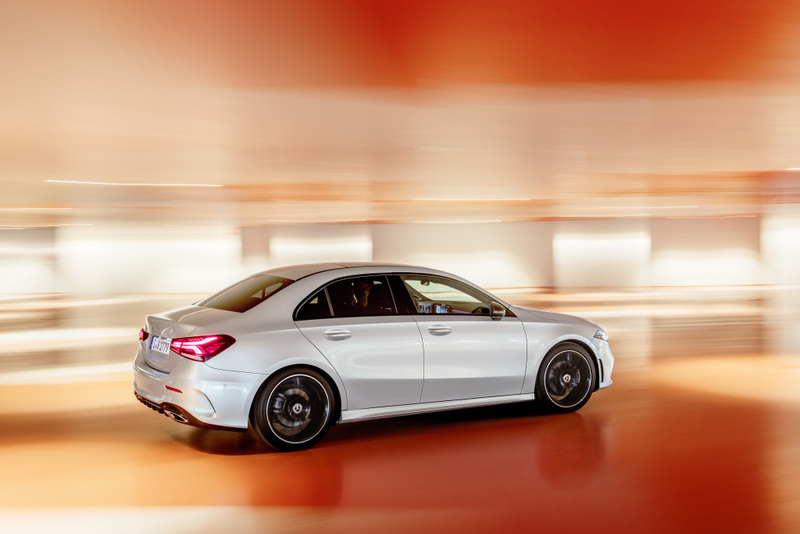 All other models have a weight-optimized torsion-beam rear axle. 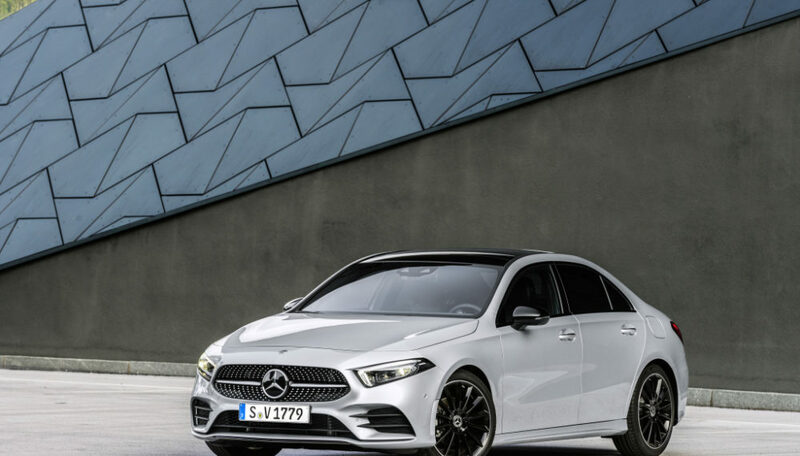 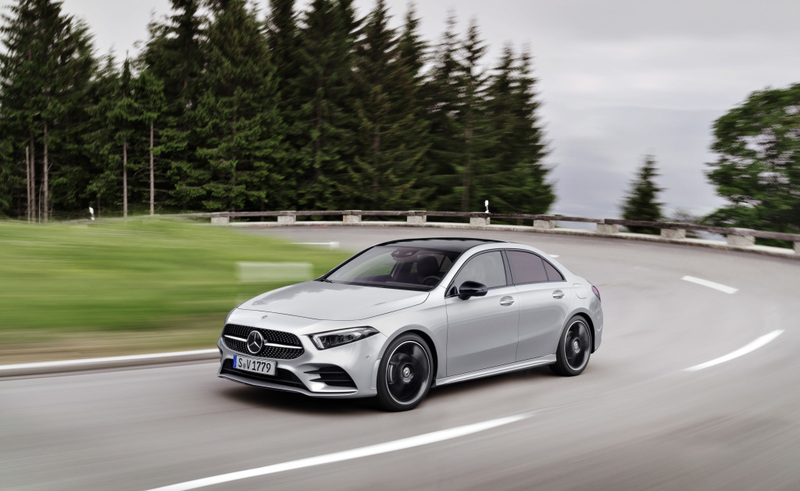 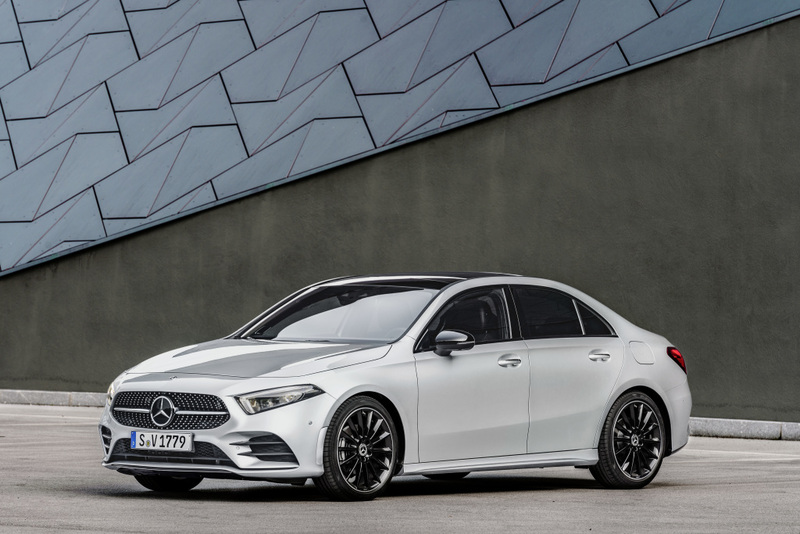 The all-new 2019 Mercedes-Benz A-Class Sedan will celebrate its World Premiere in Brooklyn, NY in July 2018 and will go on sale in the U.S. in early 2019.